Analysing a structure to find out how much load it can withstand before actually building it can save a huge amount of time, effort and materials not to mention being able to sleep at night knowing your structure won’t fall down if it gets a bit windy. Having said that the cost of employing a structural engineer to analyse and calculate the mechanical, wind and snow loads on a structure can also be pretty costly and time consuming. Guessing what size materials you need or copying what someone else has done is still what most people do, but you’re left with little or no idea what loads a structure will carry, when or where a failure will occur or if there is a better, more cost effective way to build in the first place. Force– a single point of load, we won’t get into multiple load or loads spread over a large area for now. 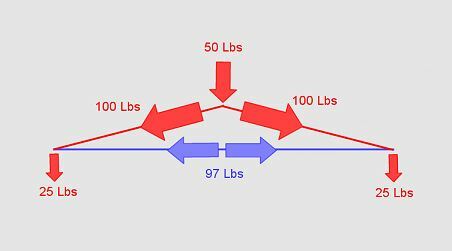 Compressive load – crushing force, we’ll use red lines in diagrams to show this. Division of load or force – four legs on a table divide the weight between them. Multiplying load or force – Pulleys and levers can multiply a force certain structural layouts can also do this. We can demonstrate all of these forces in one simple diagram. Below we have a simple triangle frame held on two supports with a force of 50 lbs applied to the top. The triangle side supports have a compressive force of 29 lbs, the bottom support has a tensile load of 15 lbs resulting in a 25 lb load on each bottom corner. If we change the shape of the triangle frame you will notice a big change in the loads. 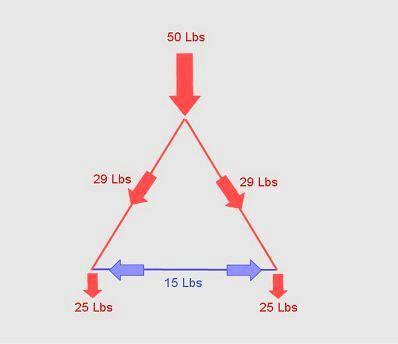 We still have a 50 lb force at the top and this is transferred equally to each bottom corner but the tensile and compressive loads in the triangle frame have greatly increased, the only alteration was to lower the height of the triangle. We can apply this simple concept to a wide range of structural elements to work out roughly what sort of forces are acting on a structure, lets start with a typical 3 frequency dome and compare it to a typical house to get an idea of what''s involved. To analyse the standard house we need to consider wind direction as the house will present a very different surface shape depending on the direction of the wind, calculations for stress and aerodynamic performance should be carried out on a minimum of 4 wind directions but preferably 8 even a very plain box type house will have 3 different aerodynamic profiles. A pure dome however has the same aerodynamic performance in any wind direction as it presents the same surface area and shape from all elevations. The house example above will have a wide variety of different timber length, thickness and depth measurements, from large roof trusses of mayor structural importance to smaller, short framing timbers that interact with the major structural elements differently depending on the angles, joints used and fixing methods of these elements. 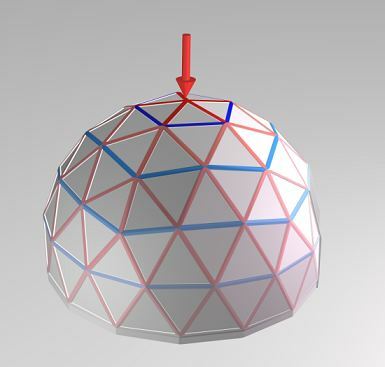 A geodesic dome on the other hand has timber struts of a similar length and size throughout the whole structure and all are jointed in the same way with only a small variation in connection angles. Geodesic domes are generally thought to be a more complex and challenging exercise when it comes to structural analysis, however when we look closely at the design and construction of geodesic domes they are incredibly simple and efficient structures. Structural analysis is in fact greatly simplified rather than made more complex by the geodesic layout and spherical shape of the structure. We’ve dealt with basic some of the basic concepts of structural analysis so now we’ll take a look at a 3 frequency geodesic dome in a little more detail. In the diagram below we’ve placed a force on top of our 3v dome and colour coded the struts to show approximately how much compressive or tensile force is applied to each strut. Compressive forces are shown in red and tensile forces are shown in blue (deeper colours show higher forces). At the point where we’ve placed the downward force the hub is under compression however you will notice a series of tension rings circling this point all the way down the dome, all other hubs have a combination of tension and compression, 2 struts under tension and 4 under compression. Greatest tensile and compressive stress is close to the applied force. This is a very simple example but it gives a practical insight into what forces are acting on the hubs so we can do some real world testing. One of the most common mistakes made when testing hub strength is to build one hub with the struts sticking out then place it on the floor and stand on it. This doesn’t give anywhere near an accurate representation of the real forces each hub will undergo. One of the main problems is if you have long struts there will be much more force applied to the hub than if you have short ones. Hub strength is a separate element to strut strength so we need to structural analysis them separately. A better way would be to build the top pentagon section with six hubs before standing on it, this would give a much more accurate hub load but no one wants to build six hubs at a time just for testing. So to structural analysis a single hub accurately we need to build a simple structural analysis rig, the diagram below shows how to construct a structural analysis rig using one hub, 5 struts (any length strut can be used) and a strong piece of plywood. 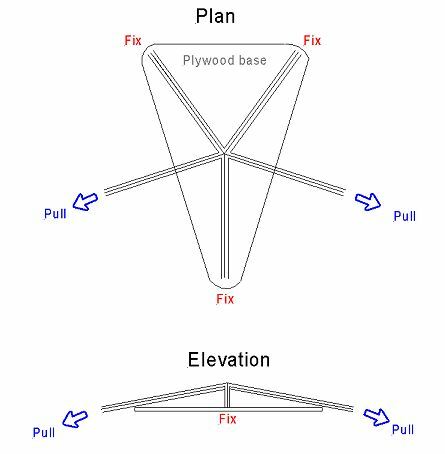 To structural analysis a pentagon hub, fix three struts to a solid plywood base then apply a pulling force to the remaining two loose struts. Pull both together directly away from the hub. This will structural analysis the hub under compressive and tensile loads, if you can measure the force needed to break the hub this will give you some figures to work out wind and snow load capabilities for your dome. Test a strut by hanging a progressively larger weight in the middle of the longest strut until it also fails; what we want is for both elements to fail under similar loads so the structure doesn’t have over engineered elements that waste materials or weak elements that could compromise the structure prematurely. I’m currently writing the next article that goes into more detail and has a 3v dome structural report.